272 pages | 4 B/W Illus. 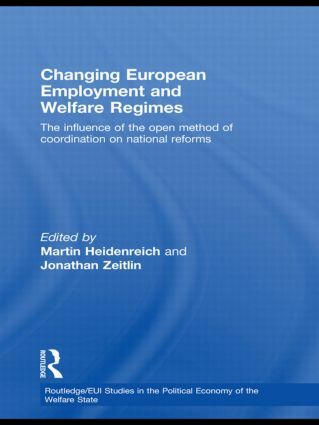 This book examines how and to what extent the European Employment Strategy and the Open Method of Coordination (OMC) on Social Protection and Social Inclusion have influenced national labour market and social welfare policies. Focusing on the implementation of the OMC in different national environments, this book examines how the proposals and targets of the OMC are interpreted and implemented within the context of existing national employment and welfare regimes. At a theoretical level and on the basis of national case studies, the book considers how OMC objectives, guidelines, targets, and recommendations may reshape the domestic institutional framework, how learning and participation of governmental bodies are organized across different hierarchical levels, and how non-state actors may be involved in the formulation and implementation of national reform plans. The authors conclude that the OMC has contributed significantly to both substantive and procedural reforms, in spite of the many institutional barriers to Europeanization in this policy area. Featuring comparative case studies across a number of European states, this book will be of interest to students and scholars of sociology, political science, public policy, and international relations. Martin Heidenreich is Founding Director of the Jean-Monnet Centre of Europeanization and Transnational Regulations and Jean-Monnet-Professor of European Studies in Social Sciences at the University of Oldenburg, Germany. Jonathan Zeitlin is Founding Director of the European Union Center of Excellence and Professor of Sociology, Public Affairs, Political Science, and History at the University of Wisconsin-Madison, USA.